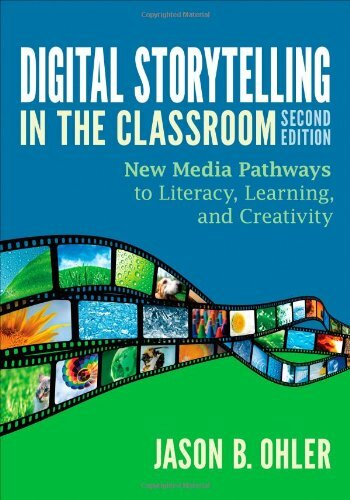 Digital Storytelling in the Classroom: New Media Pathways to Literacy, Learning and Creativity. Learn more about Jason's book about digital storytelling and new media narrative in education. Read reviews, peruse the table of contents, or purchase the book. Would you like your copy "signed at a distance?" Then contact us to receive a bookplate you can add to the inside cover. Orchestrating the Media Collage. This article appeared in the Feb-March 2009 issue of Educational Literacy, and addresses the many skills we need to be literate in the digital age, including the ability to tell effective stories. This master site provides easy access to the many art and storytelling materials available through jasonOhler.com. Digital storytelling materials are divided into the five parts described below. All websites are cross-referenced and can be reached regardless of where you start. Part I. Storytelling, learning and literacy. Start here. This site provides an overview about how and why storytelling and digital storytelling in particular can be used to advance literacy and learning in content areas. Part II. The art of storytelling. How to create compelling stories, regardless of the media used. This site focuses on the actual processes of helping students create, develop and produce digital stories within a classroom context. Part III. The technology, techniques and resources of digital storytelling. What to buy, how to use it. Also, where to find free resources and how to use digital storytelling as a vehicle to teach media literacy - "Recognizing, evaluating and applying the methods of media persuasion." Part IV - Assessment. How to assess digital stories and new media narrative projects. Part V - Copyright and fair use in education. How to gain some perspective about what is legal, ethical and reasonable in regards to student use of material created by others. Beyond Words- New Media Literacy and Fluency. Theoretical and practical overview of the rise of new media literacy in education. Green screen storytelling a step-by-step pictorial how-to guide. This site chronicles a green screen storytelling project Jason led in Nome, Alaska. It shows the same process used in all of Jason's green screen digital storytelling projects. The World of Digital Storytelling. Jason's Educational Leadership article, now in both English and Spanish. Art the 4th R- Article. Jason's Educational Leadership article, translated into 14 languages.